I have recently started to remain barefooted more often. Largely because we are now in summer and it is fantastic to take the opportunity to wear summer clothes and leave the sock draw alone. However, there are incredible health benefits to spending more time barefooted, not only from a physical point of view, but also on a more spiritual level. Did you know that the feet are the most sensory-rich parts of the body? Huge concentrations of proprioceptors are in the feet, found within the joints, connective tissue and muscle. The feet alone have as many proprioceptors as the entire spinal column! Here surely lies the science behind the art of reflexology? But wait a minute – what are proprioceptors? Proprioceptors are nerve endings and sensory receptors located within our joints, connective tissue and muscles – not just in the feet but all over the body. Proprioception is the ability to perceive the motion and position of our body. When our proprioceptors identify pressure or movement, they send messages to the brain to understand orientation. What is important to remember that the feet are rich in proprioceptive nerve endings. Shoes create a barrier between the sensitive soles of our feet and the ground. By going barefoot, proprioceptors are optimally stimulated, and the sensory experience is opened up. Are we, as a modern society, shutting down an important sensory area by continually wearing shoes? Are we disconnecting ourselves from our surroundings? Could the continual wearing of shoes be a major player in inflammation and pain? There is growing evidence to support the idea that “free electrons from the earth neutralize the positively charged free radicals that are the hallmark of chronic inflammation.” But this is for a separate blog post. 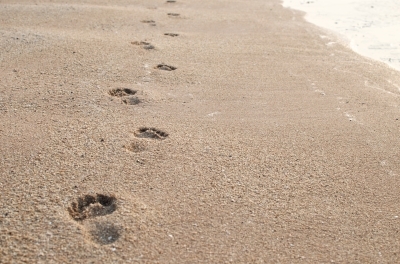 Spending time barefooted also encourages presence of mind and conscious awareness. While walking barefooted, the information sent via proprioceptors inhibit other peripheral sensory input. This creates focus and awareness; we become more tuned in to our surroundings. I have found that it makes me more “present” or “in the moment”. Having the heightened sensory experiences from the soles of my feet connecting all the way up through my body allows a more intimate connection with my environment. It is truly amazing and exhilarating to feel the cool wet grass under my feet, or the sharp stones of the beach making me wince and focus only on the moment, the now. It is surprising how warm our garden path feels under my feet when it still feels chilly enough to wear a sweater and body warmer. These small observations represent an enormous sensory dimension that we are all excluding from our lives through shoe-wearing. I believe all of the above have strong links to the science behind reflexology. I believe that reflexology treatments awaken the sensory proprioceptors that are largely dormant from our constant shoe-wearing. Rediscover yourself barefoot. Let’s celebrate our feet, touch them, use them, let’s set them free! J Altern Complement Med. 2007 Nov;13(9):955-67. This makes total sense 🙂 One of my neices has dyspraxia. When she was little she refused to wear shoes or socks. Tthe point about negative ions is a good one too. Thanks for this article – very illuminating!